Because of changes in the service economy, the service-oriented management (SOM) approach has been adopted widely for contemporary enterprises. Service-oriented management is the operational management of service delivery within a serviceoriented architecture1 (SOA), which provides a differentiated service delivery capability during operation. SOA furnishes a basis for e-service composition and delivery over the Internet and allows e-service companies to design customized e-services and combine them dynamically based on their needs (Ordanini and Pasini, 2008). This concept enables firms to manage and serve customers anytime and anywhere via any device, that is, CRM can be executed without the limitations of location, time, device, and service type. Customer relationship management (CRM) is a significant issue for today’s companies. In particular, a good CRM strategy may assist firms to earn advanced profits, increase customer perceived value, and acquire new customers. In this study, CRM is transformed from traditional CRM (face-toface) to Internet-Enabled CRM (over the Internet). 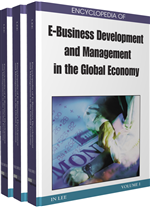 This chapter defines Internet-Enabled CRM as conducting CRM by utilizing devices which can deliver e-services through the Internet. The extent of Internet-Enabled CRM includes electronic CRM (E-CRM), mobile CRM (M-CRM), and ubiquitous CRM (U-CRM). In the era of wireless technology, three dimensions of value are identified for Internet-enabled CRM: (1) business value, (2) customer perceived value, and (3) social value (see Fig. 1). Business value is generated from companies and is always represented by monetary value (e.g., profits). Firms can easily observe the changes in profit (customer profitability) for a given time period and can modify their CRM strategies accordingly. Customer retention another indicator with which to measure profits. According to the 80/20 rule, 20 percent of customers will generate 80% of a company’s profits, so it is important to retain those customers. Internet-enabled CRM provides Internet-based e-services that customers can access anytime and anywhere, and companies can utilize new technologies (e.g., wireless and mobile devices) to help earn profits based on certain e-services, so Internet-enabled CRM is believed to attain high business value. Internet-Enabled CRM: The concept that enterprises can conduct customer relationship management via Internet-based platforms. For example, customers can use PC/laptop or mobile device to access Internet. Companies can provide CRM e-services through these devices to assist customers solve their problems anytime and anywhere.